This enables us to clear blockages and is also used for cleaning new drainage ready for CCTV inspection before passing the drainage over to the local authorities. 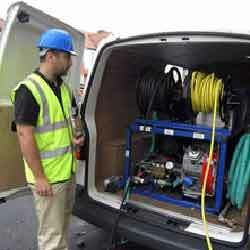 Blocked drains are caused by many faults such as: Fat encrustation, Cracks & displaced joints, Roots ingress and many more.High pressure jetting will enable us to keep all your drainage clean and blockage free throughout your service contract. Using the most compact but versitile tractor unit and coiler unit on the market today projecting back high quality colour images. 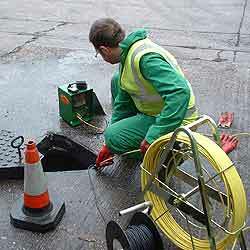 Close circuit TV surveillance enables us to ascertain the condition of your drains. 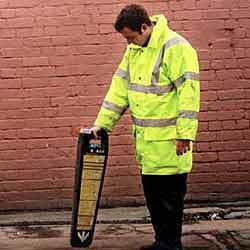 We provide the customer with a complete and full report listing any recommendations of any remedial works. With the aid of latest technology in trechless repairs, drains can be renovated to an as new condition therefore saving time and most of all MONEY without the headache of major excavation works. 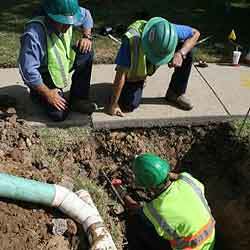 Drain lining is a proven and established method of placing a pipe within an existing damaged pipe without excavation and with minimal disruption. The new pipe material is similar to GRP (glass reinforced plastic) and in all cases will be superior in quality and in strength to the pipe it lines. The new pipe is moulded into the damaged pipe by a method called inversion using air pressure fitting the new pipe tight to the wall of the existing pipe. When the inversion is complete the new pipe which was originally flexible is now ridged resulting in a strong pipe fitted into another pipe with minimum loss of cross section (approx 6%). The liner is manufactured from a special dense impermeable felt and is designed and tailored to fit exactly the internal dimension of the damaged pipe. It is generally cheaper, less disruptive and cleaner to line a drain than to renew it, involving little if any disturbance of the ground on which the drain is laid. Excavation of faulty drainage is carried out to the highest standard, conserving and re-instating the affected area to its original condition, causing the minimum amount of disruption. Maintenance of soakaways has always presented problems, usually in finding them! This is certainly the case with rubble-filled ones. All soakaways should be provided with some form of inspection access, so that the point of discharge of the drain to the soakaway can be seen. This access will identify the location and will allow any material to be cleared from the soakaway.